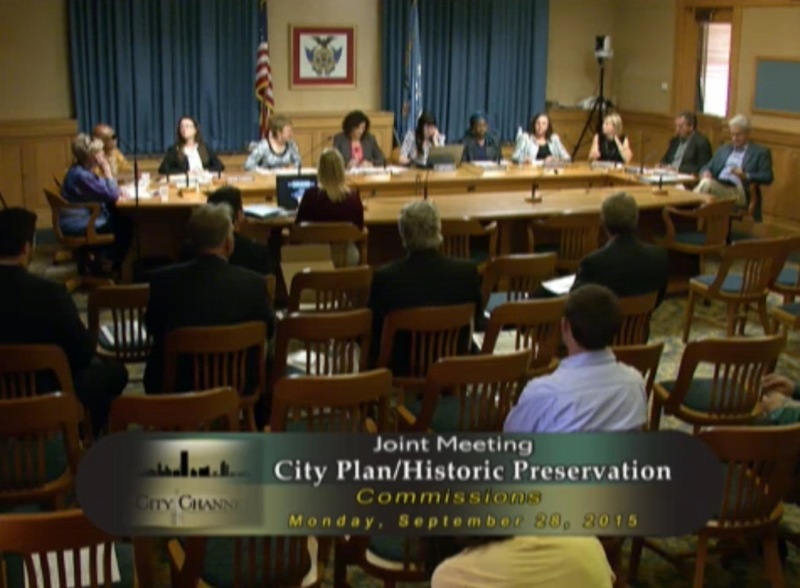 On September 28, 2015, a joint meeting of the City Plan and Historic Preservation commissions was held to review a proposed project on Brady St. It lasted about ninety minutes and you might want to watch it. The meeting exemplifies the issue I wrote about in my last column about architectural review boards and how constraining they can be. Coming before the commission were developer Peter Odgen and architects from Engberg Anderson, two experienced hometown players in Milwaukee’s real estate market who had failed repeatedly to get a Certificate of Appropriateness from HPC, meaning the project couldn’t go forward. At issue was whether building would fit into its neighborhood. This has become the guiding principle for the Historic Preservation and City Plan commissions that frames architecture in Milwaukee. On the one hand, this principle makes it very difficult to build utterly inappropriate and tawdry buildings in prime locations. But it can also curb the imagination of architects and spirit of developers who might create something authentic, instead insuring we get only polite echoes of a neighborhood’s historic architecture, the latest example being the less-than-landmark Kimpton Hotel in the Third Ward. He noted “the eclectic feel of the site,” and his power-point demonstrated that Brady Street has had a great variety of architecture, having been built by different generations using different ideas, methods, and materials. To Ernst, this variety of architecture gave Brady Street its character. But the alderman for this district, Nik Kovac, demanded a narrower field of view. He wanted the building to blend not just with Brady Street, but with a 350-foot strip on the north side of Brady. He literally asked the architects, “Why don’t you just make model showing just the buildings on either side” of the site — the old Glorioso building and the Saint Hedwig’s Church. The Glorioso building is actually two structures — a German Renaissance Revival building from 1910, which used to be Hellman’s butcher shop; and a Mediterranean Revival building from the 1920s that was built when the Italians took over the street. Across Humboldt is Saint Hedwig’s Church, a hybrid of Romanesque and Gothic architecture built in 1886. So Kovac’s narrow swatch of street consists of a polygot of styles and types of buildings that go back at least a thousand years. Not to mention there’s a pagoda inflected Chinese restaurant next to Glorioso and another crazy quilt of architecture across the street. So where does that leave the architects? There is no recipe that combines one part Roman, one part Gothic, one part German, and one part Mediterranean into a digestible whole. “East Brady Street’s unusual array of architectural styles and building types and the irregular siting of the structures sets it apart from the city’s more typical neighborhood commercial strips which developed over a shorter period of time with greater architectural uniformity,” the report concluded. In short, if the role of the Historic Preservation Commission is to assure conformity with the district, then there should be great freedom for Ernst within the very eclectic tradition of the street. Odgen and the Ernst had by now been though a year of meetings and more than 12 iterations of the design. His frustration was clear. Vanessa Koster of The Department of City Development tried to move the meeting along. The developer, DCD, and the City Plan Commission were on one side of the issue, with Kovac and HPC on the other. But Kovac held his ground. Kovac had first run for office after losing a fight with the city, which let developer Joel Lee put a parking structure on an empty lot between the home of Kovac’s parents and Downer Avenue. Kovac is passionate about local control of real estate development. To help his cause he fought to get HPC under the control of the Common Council instead of DCD. The meeting was kind of a rematch of the Downer fight, Kovac against the city and a real estate developer, only this time the game was being played on his home court. He was the alderman for the district (and council members generally have tremendous autonomy regarding neighborhood decisions) and he had HPC in his pocket. The commissioners deferred to the alderman. This was Kovac’s meeting. The meeting took a sharp turn in another directions when Dean Doerrfeld, a Senior Planner for HPC testified. He agreed with Kovac, and said he came to the meeting to say HPC still opposed the project. If that was supposed to guide the architects, Whitney Gould wasn’t having any of it. She’s a member of the City Plan Commission, former architecture critic for the Milwaukee Journal Sentinel, and the only person in the meeting besides the architects who had names for the different styles of buildings on the street. But this joint meeting had been called in part because the developer and architect had tried to interpret the guidelines for more than a year to no avail. They clearly weren’t able to drive the bus and now this meeting seemed to veering off the road. The meta-discussion of the guidelines was tabled for another time. The building was then sent back to HPC with a list of requested design changes: wider west windows, different massing of the column, a modification of the bay windows on the corner, and a reconfiguration of the mechanicals on top of the building. Vertical windows were deemed “pedestrian unfriendly”. The project and those requested changes got kicked back to HPC again. The minutes from their October 2015 meeting say, “Staff still recommends disapproval based upon the lack of clues relating to age of construction, it’s too regular, lacking in variety and too rectangular. It simply lacks variety to the streetscape, per Mr. Doerrfeld.” Another detailed discussion ensued. Could the building be made more slender? Could spandrels be added? The project was approved by a 3-2 vote in October, but with “ongoing modifications by staff,” though the dissenters did not like leaving so many things for the staff. The building is going up as I type, some two-and-a-half years after the approval process began, with included some 18 months of various requested changes and iterations. This was the design by committee which Kovac believes in. Is this the process we want to follow for creating new buildings in Milwaukee? I would agree with Gould, that architects should be allowed to create “honest expressions of the changes and dynamism in a city.” That’s how great cities are built. That is the statement of a man too well read about the nebulous standards of obscenity (“I know it when I see it”) instead of on architecture. But if a politician avenging his dad is not a good reason for the government to do something then we never would have invaded Iraq. Keep up the good work Kovac, perhaps someday all the houses will look like yours. Can someone tell me how Casablanca’s second story addition got approved then? I’m assuming there’s a difference between the process for new construction and an addition. That building is ridiculous. Kovac has a smug haughtiness that doesn’t allow him to acknowledge other’s points of view and he’ll rudely and vehemently remind you of your place if you attempt to persuade him to try. I agree with Gould’s sentiment. Great cities weren’t built by over-educated little boys who want to get back at the City for something that happened to their daddies. The analysis imbededed in this article is spot on. What makes the East side so fun and unique is that it IS a beautiful jumble of design and style. If Kovac wants perfection, he should move to Brookfield or a similar suburb where every building is a tidy tan-colored box. I’ve met Kovac several times. He’s a nice guy. Have you met him AG? You speak like you know him. Vincent, yes. And I agree, he is a real nice guy… until you disagree with him or piss him off in any way. I apologize for getting off topic but I couldn’t see post 6 for three hours (and imagine I won’t see this one posted for awhile). Is everyone experiencing that? Is there some new moderation process in place? The tone of this story is highly personal and I’m not clear on what the point is. The other target is the Historic Preservation Commission (HPC), which is charged with determining appropriateness of plans affecting properties and districts designated as historic. It sounds like its members, as with any appointed commission, are trying to conscientiously do their job. 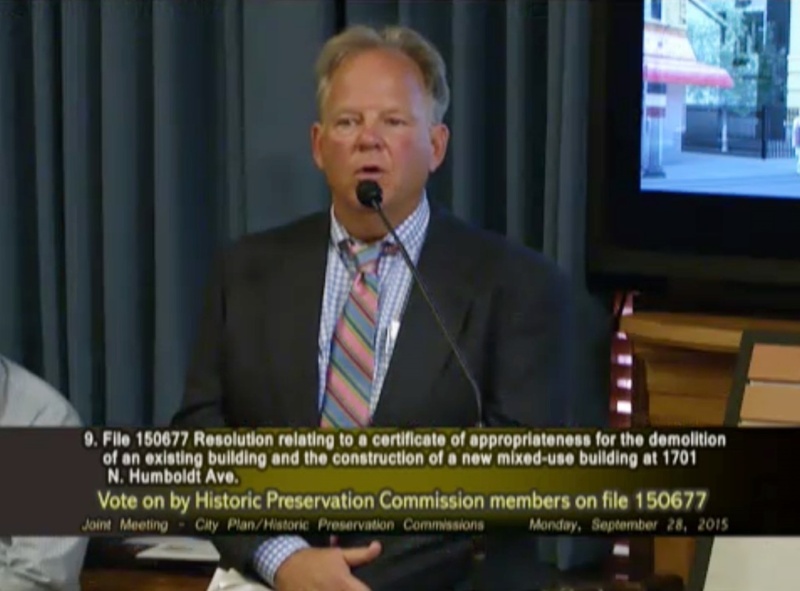 Curiously, there’s no mention of the Alderman Bob Bauman, who has served on the HPC for a long time and has thus been involved in many projects involving historic preservation. Tom, if you have issues with the HPC as well as Third Ward’s Architectural Review Board, it’s not clear why you don’t at least mention the alderman with far more influence on these issues (shown in several photos of the meeting) than Ald. Kovac. In any case, perhaps you fault the entire review process and maybe its premise. Would you prefer a rubber-stamping HPC, Plan Commission and CC? Re “Kovac is passionate about local control of real estate development. To help his cause he fought to get HPC under the control of the Common Council instead of DCD.” Are you implying that that decision, also championed by Bauman, was a bad thing? Isn’t that true of everyone AG? Certain people who are otherwise nice are real dicks whenever you disagree with them. Not naming names. Vincent Hanna, yes, there is a delay now. I’m learning not to take it personally. I sure hope that the residents that opposed this building never speak out about services being reduced by the city (or county). A loss of $20 million in assessed value would mean an extra $215k/year in city revenue from property taxes. That’s the budget for projects by the Milwaukee Arts Board or the municipal ID. His motivation for running for office have planted a seed of fear from the 15 people who would vote against him in a couple years over this particular project. The balance may be wrong, today, but as a citizen I’m inclined to prefer some tension in reaching a decision. And that assumes all parties ARE working towards a realistic, compromise goal. How little input we get on some architecture? Take a look at the developments in Bay View, there are several new ones that look cheap. Dwell. Urban. The Art Stop. All carefully avoiding public input. Urban living units still is not rented out, after 8+ years on KK and Becher; their first idea was a residence for seniors (far from any store, at a wild intersection); we managed to move them beyond that. But the architects were hell-bent. The tragedy of doing nothing is the adventure of TeachTown at the old Dover School; pecked to death by conflicting voices, and a domineering public official; the result a design that can’t get funding. The developer found her talents accepted elsewhere. great discussion here. Couldn’t agree more with Sam about Ald. Kovac’s inconsistency on these issues. At least Bauman is consistent in his position of historic preservation. While I agree with Tom that the Journeyman should be a modern simple building that shares only size and scale with the surrounding area, Bauman believes in the boredom of copycat design. Everywhere. All the time. Meanwhile, Casablanca is an abomination that should has no historic context and should never have been approved. and the new Hammes building is a Bluemound Road monstrosity. Development thrives on North Avenue and Brady Street but Downer Avenue is dying on the vine because of Kovac’s protectionism of his parents. The Downer Avenue parking structure, which has allowed the theater to survive and the 3 restaurants to thrive was another example of HPC’s design by committee that is a bastardization of Matt Rinka’s original modern design. Another Kovac inspired mistake. The move of HPC to the Common Council was the worst thing that could have happened. 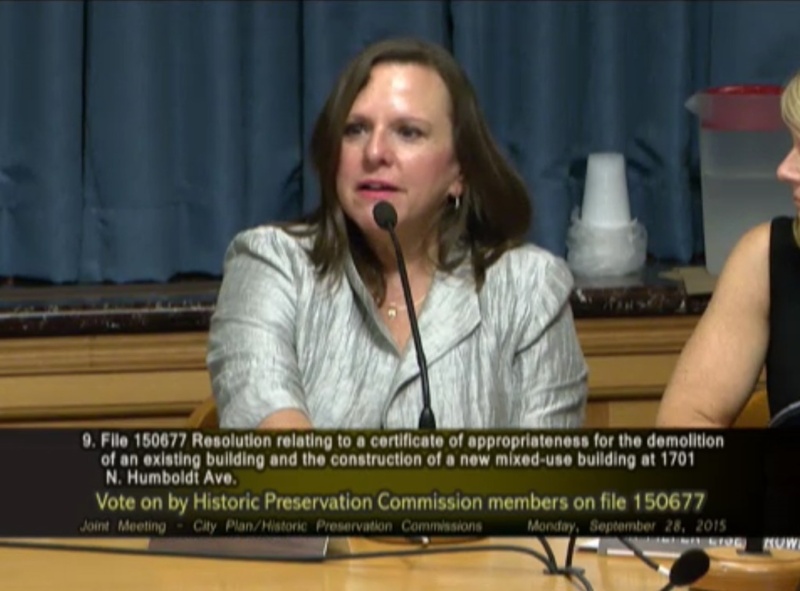 Most Alderman could care less about historic preservation. That leaves Kovac and Bauman to control the staff to fulfill their parochial wishes. Under the influence of the administration the body and staff had a more global perspective that was good for the entire city. If not for the reasoned opinions of Whitney Gould, Matt Jarosz and Blair Williams the Commission would be a rubber stamp to old thinking and boring faux historic architecture. Show me a politicians who cowers in the face of NIMBY’ism and sticks his/her finger in the wind to see which way the wind is blowing before making a decision and I’ll show you a series of bad buildings and underutilized sites. I am not implying anything at all…….. just doing some reporting. I have no opinion on the matter.